It probably comes as no surprise that I was never the sports-fanatic enthusiast. When I was younger, my parents tried to get me to participate in almost everything: soccer, softball, basketball. Honestly, I was more content to skip practice and just play on the playground (true story). Aside from a semester on the swim team in middle school, watching the Super Bowl and going crazy over March Madness, I am the opposite definition of what it means to be “sportsy.” But from where I come from, there is one sport that brings almost everyone together, athletic or not: The Kentucky Derby. With the exception of a school trip and a recent excursion to Downs After Dark, I’ve never had the chance to actually go to the race track on Derby Day. For some reason, my state orchestra competitions always seemed to take place whichever Saturday Derby was on. But that didn’t stop me and my Dad from picking horses in the paper and betting quarters on which names we liked the most. Although it’s a large part of the event, Derby isn’t just about horse racing. The outfits definitely are a sport of their own: hats, fascinators, bow ties, dresses and (much to my disgust) fedoras. Parties are also another must-do on the list of properly celebrating Derby. However, one of my favorite aspects is the food. 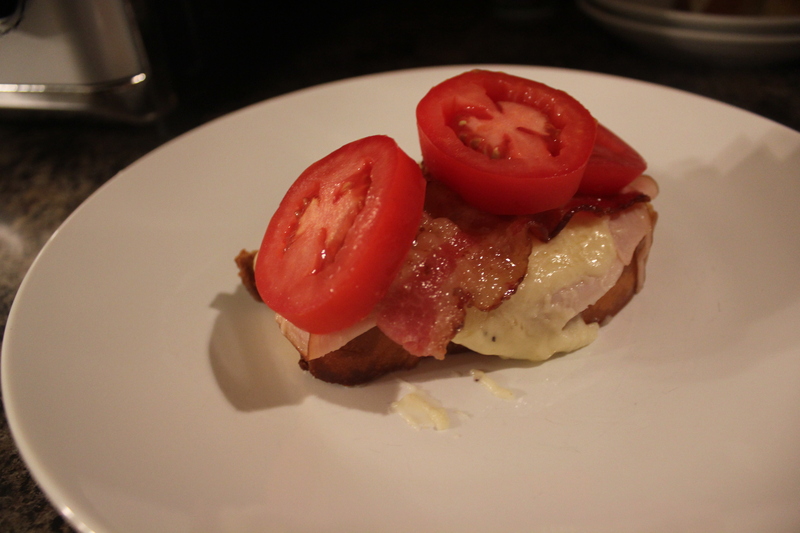 So for this post, I decided to try my hand at a Kentucky Derby classic: The Hot Brown. 1. The bread . 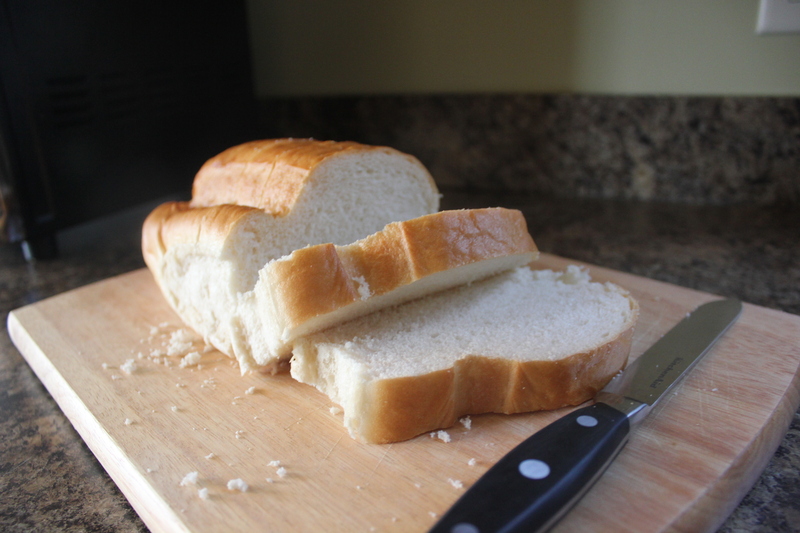 Cut the loaf of bread into four fairly thick slices. I took a different approach to prepping the bread to toast. Dip each slice in some extra virgin olive oil, front to back. 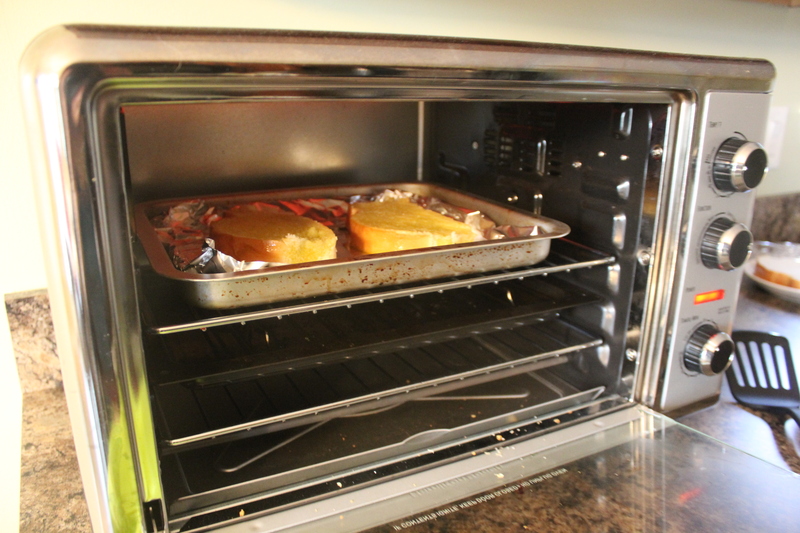 Then, place the bread on an oven pan covered with aluminum foil to make cleanup a little bit easier. 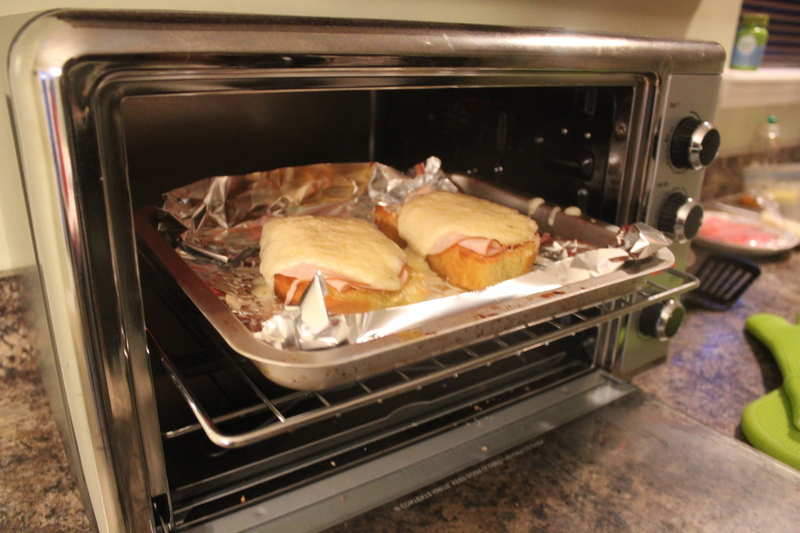 For my purposes, I used our toaster oven to cook the bread; however, you can also use a conventional oven instead. Set the oven to broiler at 400 degrees and flip the bread once each side turns golden brown. After the bread has cooked and while it is still warm, take a clove of garlic and rub each side of the bread with it. 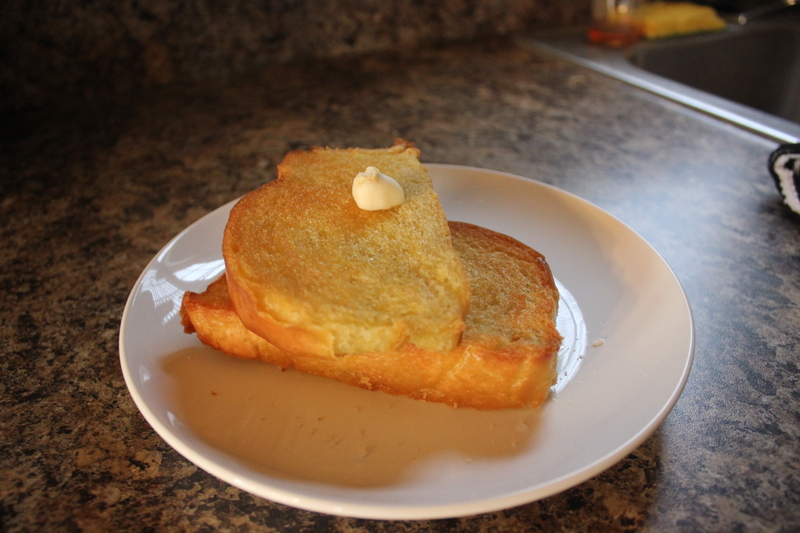 This creates a really nice flavor for the bread as opposed to plainly toasted bread. 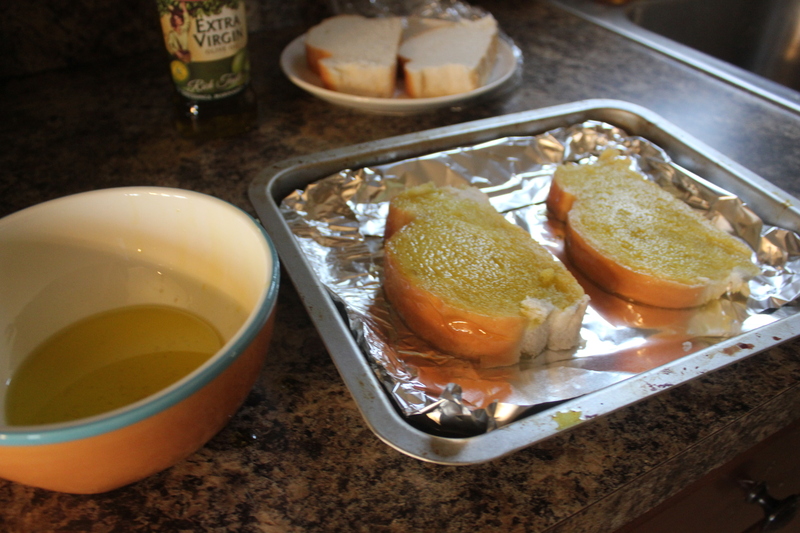 The oil will also add a nice crunch to the bread when everything is put together. It’s really important for something like bread — that doesn’t have too much flavoring — to be enhanced with a few basic yet flavorful ingredients. 2. The tomatoes, cheese and bacon. While the bread is toasting, you can start on the majority of toppings that will go on the Hot Brown. 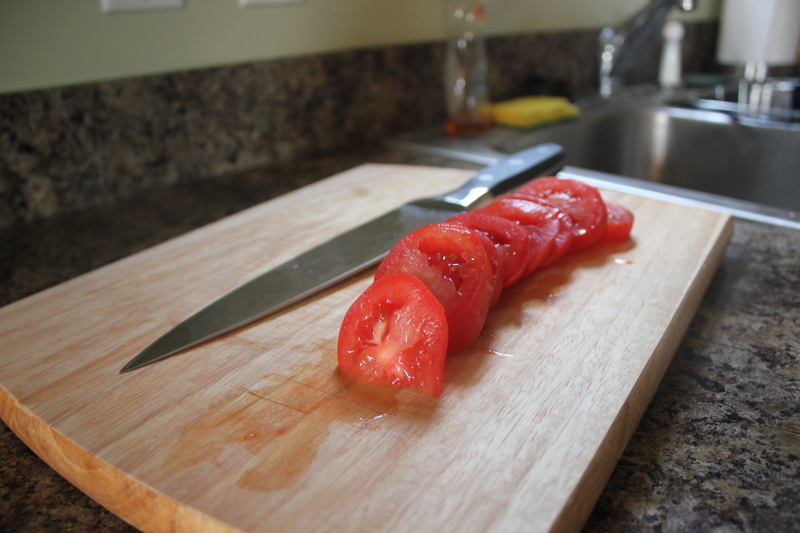 Slice the tomatoes into slightly thick pieces and set aside. 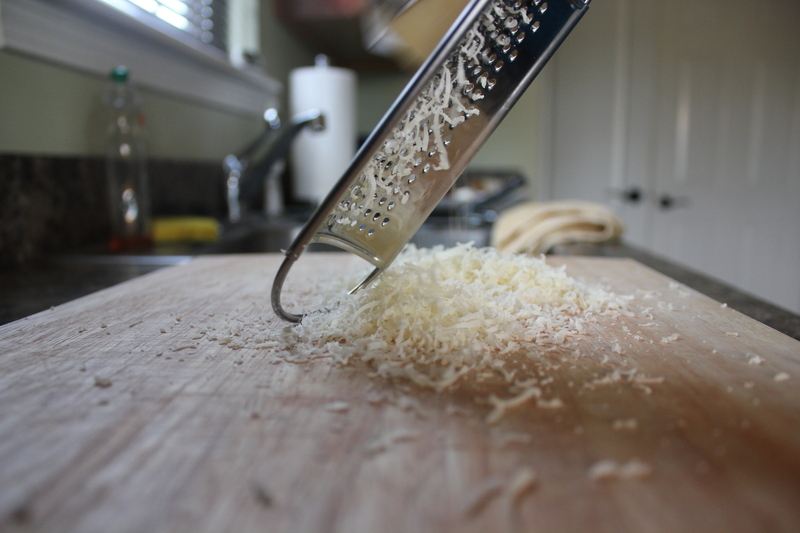 Then, begin shredding the Parmesan cheese. You’ll need about 6 ounces in total: 4 for the Hot Brown topping and 2 for the Mornay sauce. Most cheese blocks will let you know the ounce number so you can aim for the right amount. You can also use measuring cups to double check. 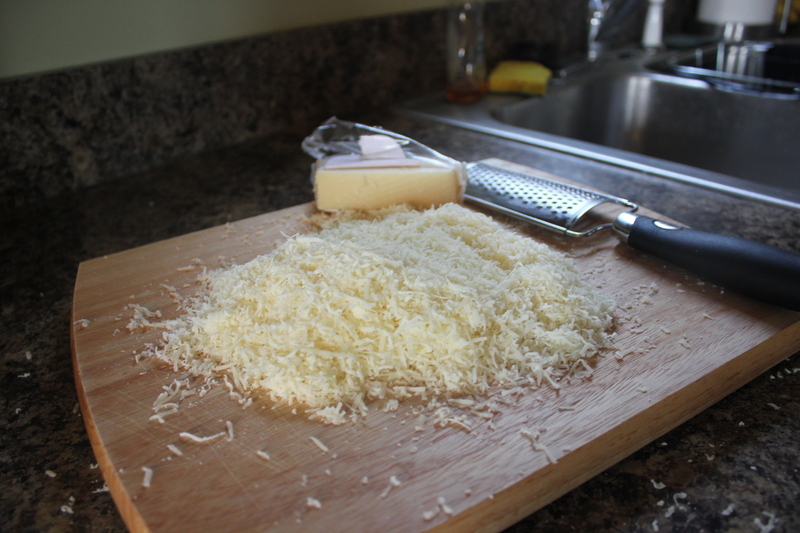 Set aside most of the cheese and keep a 1/2 cup to use in the sauce. Now we can begin with the best part of all: the bacon. 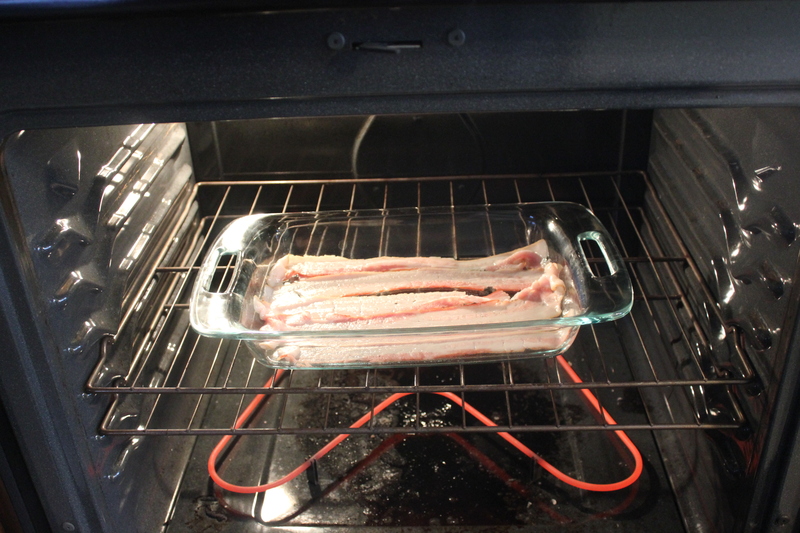 To save on stovetop space, I decided to cook the bacon in the oven. Spray a deep dish pan with nonstick cooking spay and lay the bacon out in a single layer close together. Cook the bacon per the directions on the package. 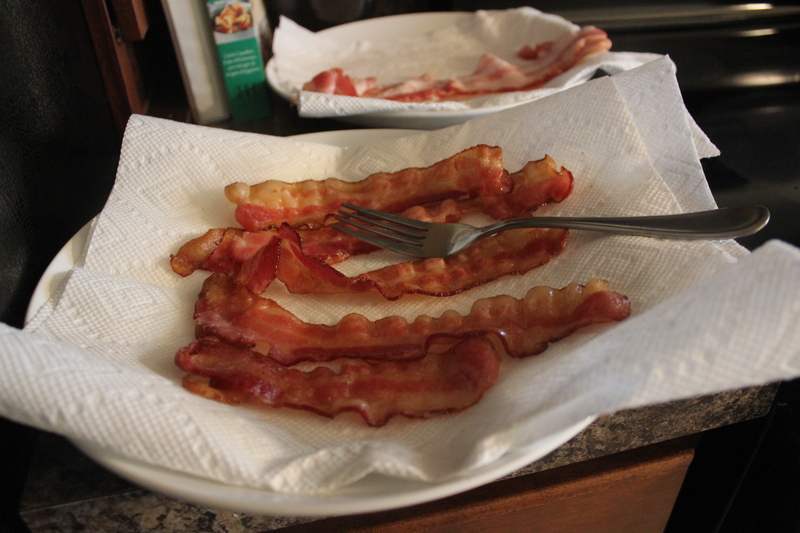 For mine, I set the oven to 400 degrees and cooked between 15 and 20 minutes, until the bacon comes out nice and crispy. Now that most of our toppings are complete, we can begin the sauce. 3. The Mornay sauce. 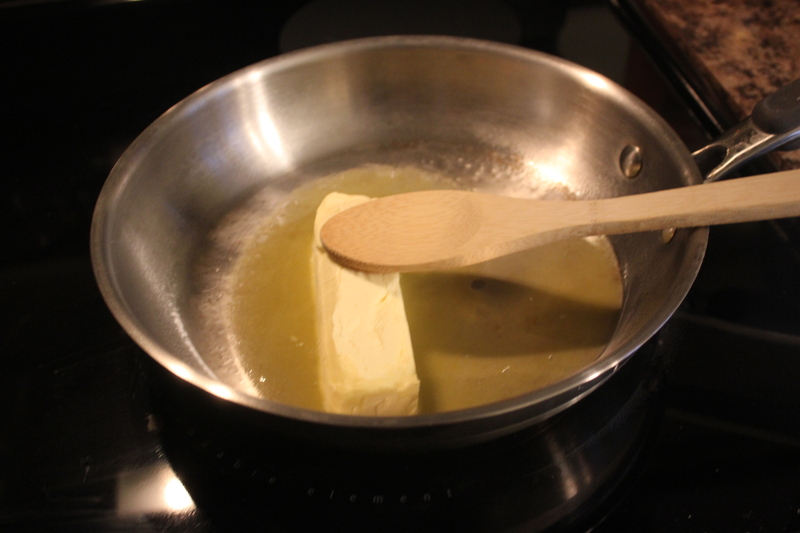 Begin heating a sauce pan over medium high heat and place the stick of butter in to melt. 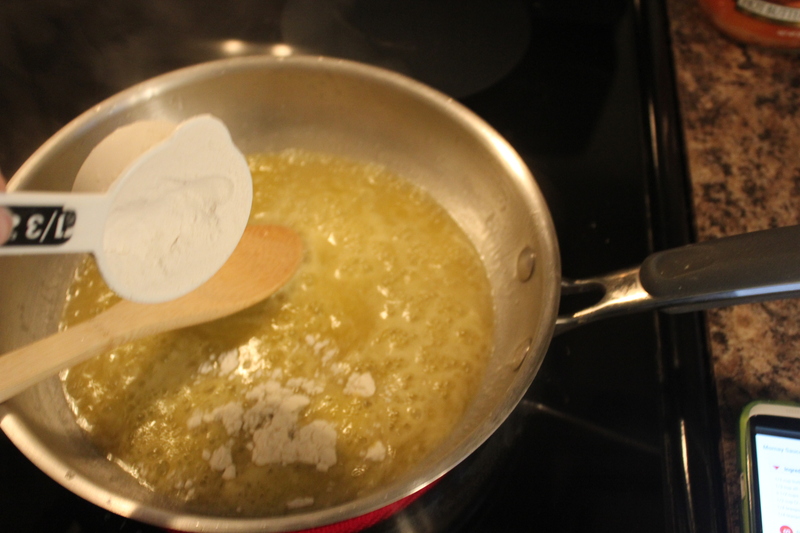 Once the butter is finished melting, start adding the flour into the mixture. The flour should cook through and create a doughy-like texture once it mixes with the melted butter. 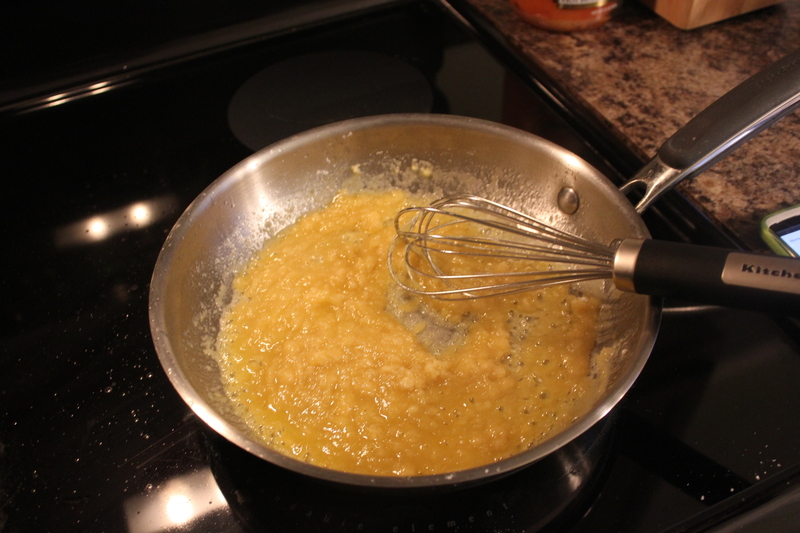 Make sure to constantly whisk this mixture so that it doesn’t burn or stick to the bottom of the pan. Once that’s complete, you can begin adding the milk. 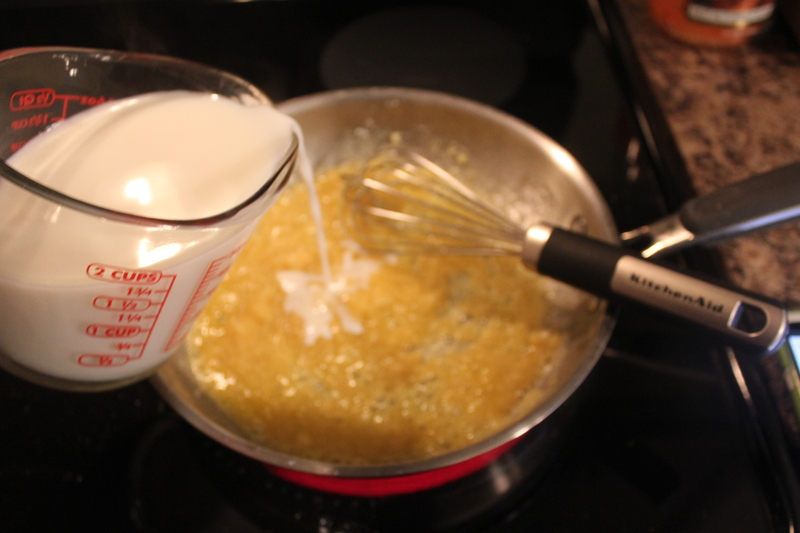 Make sure to ad the milk gradually, whisking it in to the mixture as you pour. Once all the milk is in the pan, turn up the heat and bring the sauce to a boil. 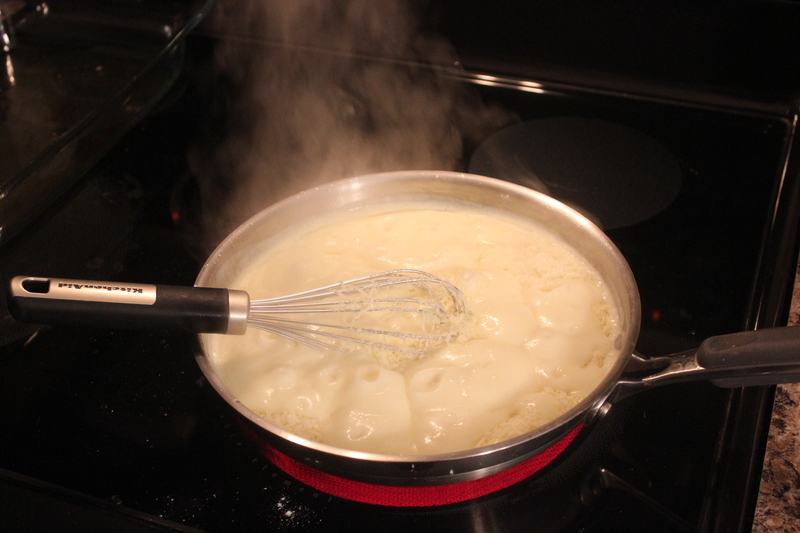 It will take a few minutes for the milk to heat up so make sure to continue whisking until it’s done. The sauce should be nicely thickened before you add the final ingredient: the cheese. Combine it together until the cheese is melted and top it off with some salt and pepper to finish seasoning. Reduce heat to a simmer before topping it on the Hot Brown. As for Winston? 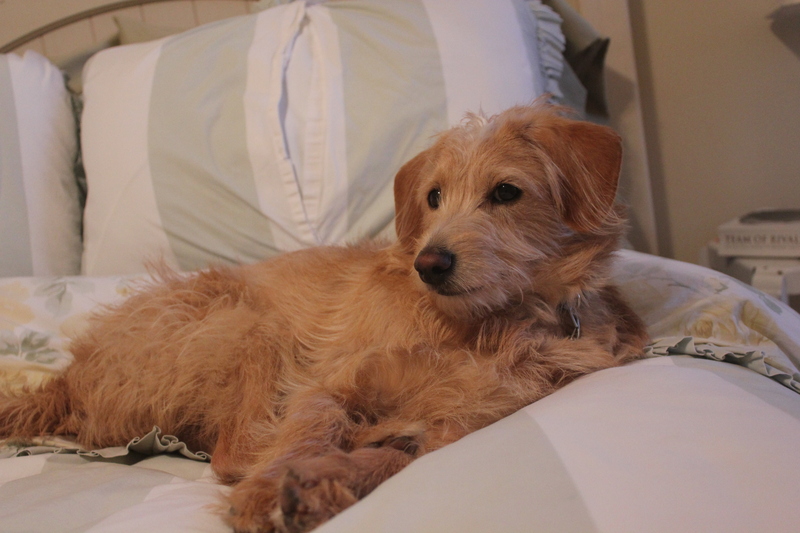 Instead of sniffing around under my feet, he likes to stay in our room until everything is complete. I think the amount of smells overwhelms him (or he’s waiting patiently for the final product). 4. Putting it all together. Now comes the fun part. 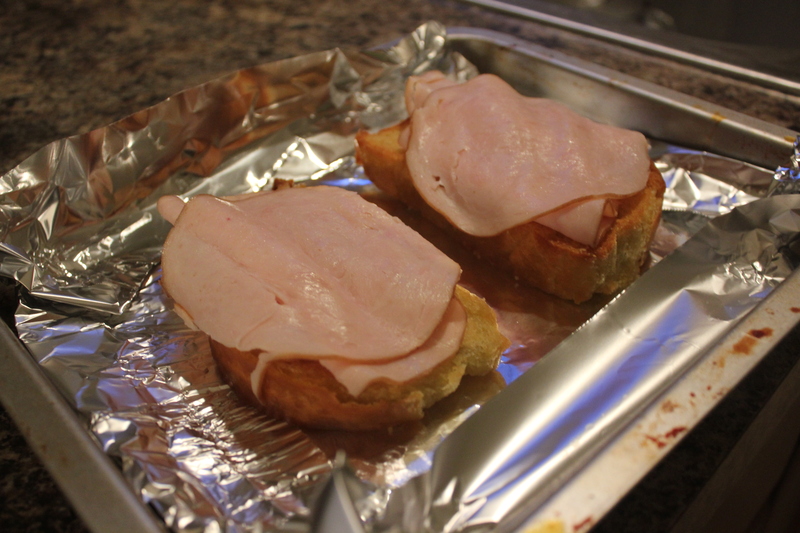 Place the toasted bread on a pan lined with aluminum foil and top the bread with the turkey slices. You can either buy the kind in the package or have it sliced by your local butcher. Then, smother the bread and turkey with the Mornay sauce. Since it’s so thick, the sauce should stand up well on it’s own on top of the turkey. 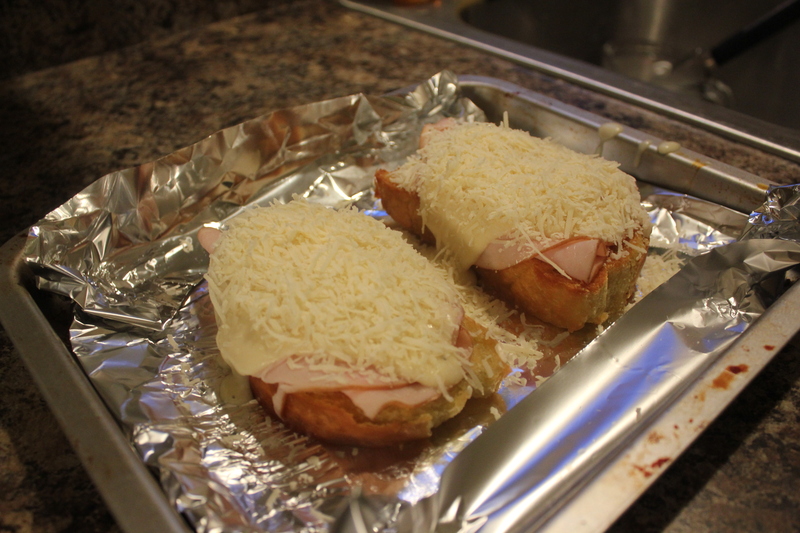 Top it with the remaining Parmesan cheese before placing it back in the oven with the broiler settings from earlier. It should only take a few minutes — about 5 or 6. You only want to heat it long enough for the cheese to melt and everything can blend together for a moment. Once everything is finished, take the Hot Brown out of the oven and top it with a few slices of tomatoes and pieces of bacon. And there you have it! It may have a lot of parts, but the end result is well worth the work. Here’s to the perfect Hot Brown and an exciting day of racing at this year’s Kentucky Derby.